Greg's step dad Chucks mother passed away and the family was all in town for the Funeral and so we thought it was the perfect opportunity to invite the to Kaitlyn's first Softball game. It was a good night and a great start to the season...was a little chilly though!!! In the photo are Greg's sister Danielle and her fiance Tom, his step dad Chuck and sister Bonnie .. and of course us!! This season is going to be fun as we start with the girls pitching, and also an umpire so it makes it a lot more competitive!!!! GO SCREAMING EAGLES!!! 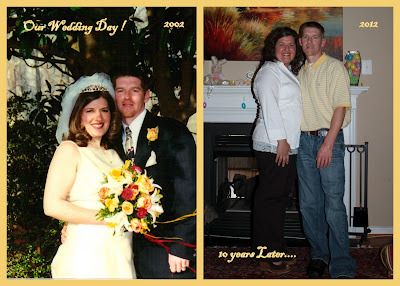 Greg and I celebrated Our 10 Year Wedding Anniversary !!! I am so happy to be with such a great man, there has definatly been some rocky roads, but he is such a wonderful husband and father! We were lucky to have a sitter for the night and we were able to go out to Dinner and a Movie... We had decided that we would go to Bonefish Grill, since I knew I could find something to eat on their Menu and than we went to the movie, 21 Jumpstreet!! It was hilarious!! It was such a good night ..umm except for I have been having a terrible toothache and after dinner it was almost unbearable..so sat there uncomfortable most of the movie! Other than that though it was so nice to spend quality time together!! In the last ten years we have grown so much and I hope that the next 10 will bring us happiness and strength, as you look out in the world today so many people give up on marriage and divorce is so easy, but I have always believed that marriage is something you have to work on Everyday !!! I love you Greg each and everyday ..to many more year!!!! I can't believe how grown up my girls are .. these are their School pictures and I am happy how they turned out but when I look at them I am so shocked at how big they are .. I officially have no babies!!! New Diet = New Life!!!! So as you may all know I got sick in May of 2011 and since than have had months of not feeling well.. I won't bore you with all the details as many of you already know them.. but my mom got in touch with a Dr. in Utah and he does a lot of work with people with very similar problems, so after trying everything that my Drs. her had told me I decided I was ready to give it a try. So on Feb. 13th I began my New Life and New Diet.. the diet is basically cutting out all carbs, sugars, etc. I pretty much eat Veggies, Fruit and Protein.. I thought it was going to be so hard, but within a few days I started feeling better and so for me it is not hard at all because it makes me actually like life again .. on top of the diet I take supplements throughout the day, which continue to make me feel better each day! I have so much more energy and actually have been working out and feeling so much better.. It is just amazing that what we put in our bodies really does have such a effect on how we feel!!! I am onto a Whole New Amber and am so Happy with my results so far!!!!! Thanks for all of your support through this Year of ups and downs!! What a year it has been for myself.. As you all know I have been sick since May and still struggle daily with being sick and trying to figure out how to have some sort of "Normal" in my life! But I am also SO Blessed!!! I have such a wonderful Family and 2 of the most Beautiful Girls! I just love them to pieces! 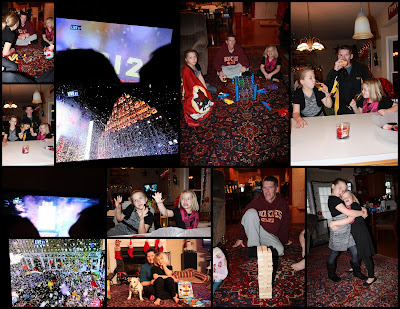 We had so much fun as we rang in the New Year...playing games (Connect 4 Launcher is a new Favorite)...eating Meatballs, wings, chips and salsa, Shrimp and Olives! We Skyped with the Aunts and Uncles which was a lot of Fun !! Greg and I even made it to the Ball drop which hasn't happened in Years! I am so Thankful for everyone in my life and for all the Blessings in my Life.. May 2012 Bring Health and Happiness to All!! The girls in their Christmas Dresses... Love Haylees.. and of course my Kaitlyn is thinking she has to look like a Teenager already !! Mommy making Christmas Eve Dinner in my cute Apron !! Greg had bought a dinner made at the store , but when I went to pick it up it was all uncooked and I still had to come home and make it all including the ham and rolls , the girls love to eat a big meal and fancy dishes.. So it was a fun night !! I had way to many Christmas Pictures so I just gave a few of the highlights! Haylee got a Real Baby that looks like a newborn and even smells like one to, with a stroller and all the accesories. 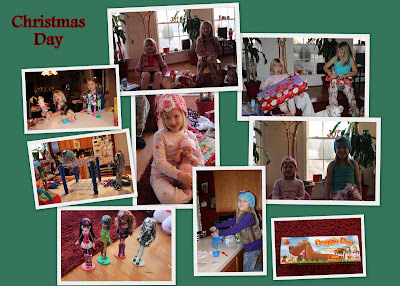 Kaitlyn got Monster High dolls which has been a huge hit. Than between the two they got wii games, ds games, and board games .. and yes there are 2 things Santa should never have purchased which are Flufflings and Doggie Doo.. so if you have a reqest for them Just say NO!!!! 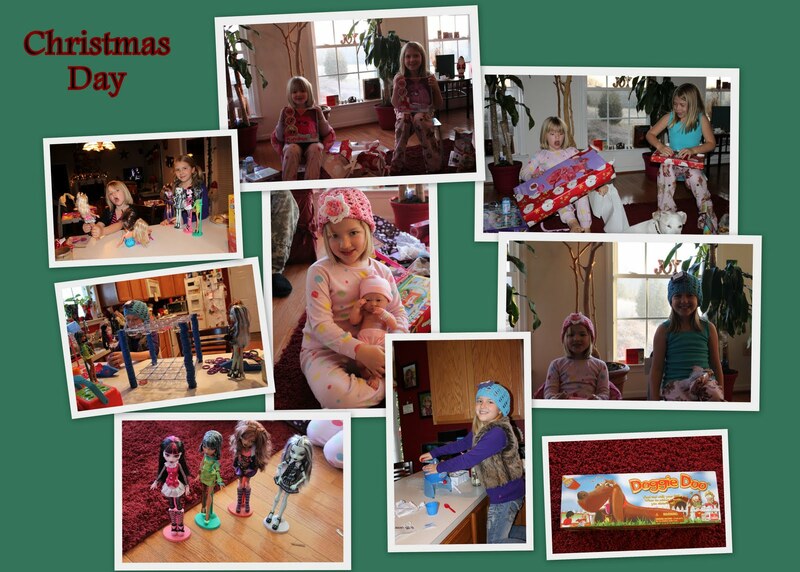 Christmas is such a Fun time of year and I loved seeing their Smiling Faces as the Opened all their Gifts!!! Until Next Year!!! After putting away my artificial tree last year.. I knew that I did not want to get it out again after 12 years it was looking pretty sad! So I convinced my husband that I wanted a Real Tree!!! So when I went to work on Saturday .... and I came home from work I had my Tree .. I wanted!!! The only hesitation was the next morning I saw a news story about people having found snakes in their trees so I was nervous for a few days, but no creatures ever came out!!! YaY! It was beautiful and I am so happy I dont have to put away my tree this year.. just throw it out!!! !